Being the child of a sports legend is no easy task. But what happens when that legend is not only on the same team as their kid but is absolutely raking at an age when he should fully be retired? 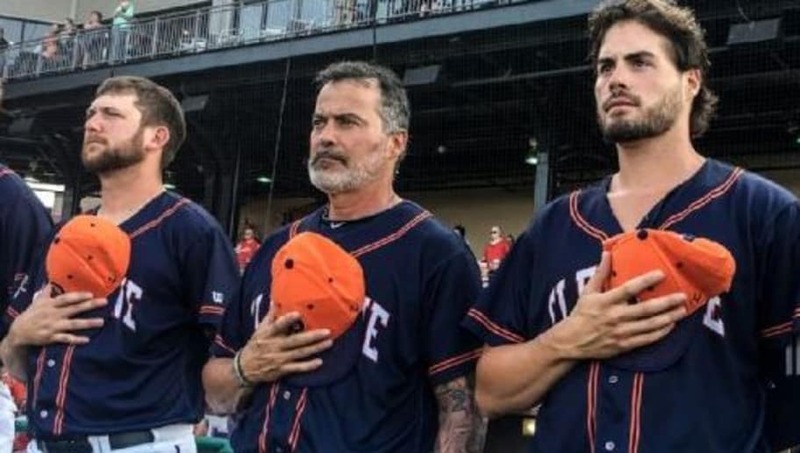 53-year-old Rafael Palmeiro and his son Patrick are both members of the Cleburne Railroaders, and Papa Palmeiro is dominating. 53-year-old Rafael Palmeiro is hitting .301/.424/.495 with the Cleburne Railroaders. ​​Rafael Palmeiro was a dominant, albeit steroid-aided, force during his 19-year career in the MLB. Palmeiro's power blossomed during his first stint with the Texas Rangers (1989-1993). By the end of his career, he'd been named to the MLB All-Star Team four times and won the Gold Gold thrice (though one of those seasons was laughable). He's one of six members of the 500 home run club and 3,000 hit club. For those worried about it, though, the comeback train has been halted a bit. Like most 53-year-olds, Palmeiro's dealing with a knee issue. Papa Palmeiro is somehow hitting at a rate that would put him in ​the top 20 in the current MLB. Will a team look at Palmeiro's stats and think about signing him? Nope. But until it becomes official, Patrick will just have to deal with being second-best to his pops.